Scouts arrived early at Camp Snyder in Haymarket, VA on Thursday 6/28 to prepare camp for an entire week of activities. They performed various activities such as moving the grass, setting up the canopies, and lashing the camp gate. After setting up camp, we all went to the dining hall to enjoy lunch. The air-conditioned dining hall was a great place to escape the summer heat. After lunch, scouts returned to the campsite to discuss about activities for the rest of the week. They were able to socialize, play cards and volleyball. Everyone reminded each other to put on sunblock and drink plenty of water. After dinner, scouts strolled around Camp Snyder making friends with scouts far and near. They all met scouts from other states as well as other countries like Germany and Australia. The scouts involved in the opening ceremony performance practiced by the stage. These scouts have practiced many times before the camp. Chợ Đêm was a blast. Scouts began to spectate matches of foosball. They wanted to play too, so they assembled their own team and entered the tournament by paying a five dollar fee. The foosball frame was put together with the help of Potomac scouts earlier in the day. On Friday, we finished breakfast early in the dining hall and get into your class A uniforms for the opening ceremony. 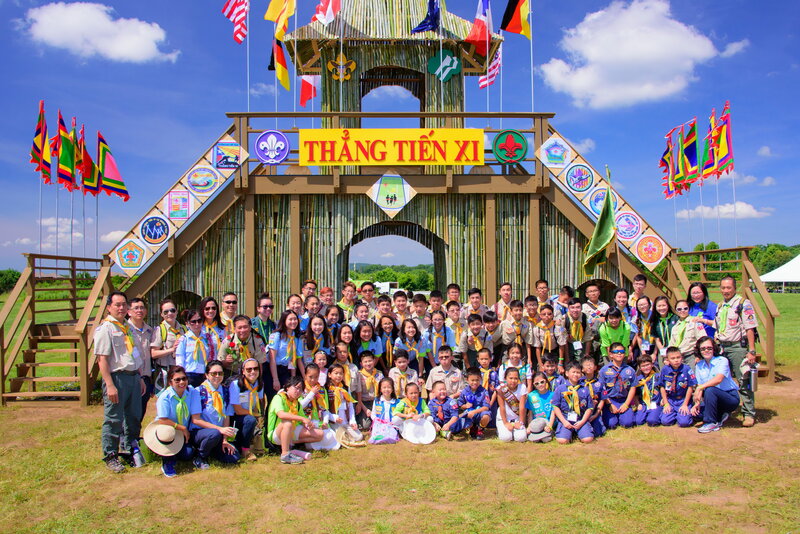 The ceremony started with all scouts from 40+ Liên Đoàn lined up with their flags and signs in front of the Thẳng Tiến 11 gate. They assembled into a square knot by following different color lines specific to their Liên Đoàn. Liên Đoàn Potomac has an honor to be a part of the opening ceremony for the official beginning of Thẳng Tiến 11. The flag ceremony was performed by the scouts from various Liên Đoàn. LĐ Potomac scouts such as Athen and Ben took part in a merged flag performance with scouts from other groups. These scouts have been practicing months before the camp. The scouts put on a remarkable show as they twirled and spun their colorful flag then transition. All this fun and it’s only the start of the 1st official day of Thẳng Tiến 11. The rest of the week calls for culture day, lots of subcamps where we played games and do activities such as swimming, zip lines, and badge trading. We will also visit the STEM shed where we make ice cream using liquid nitrogen, create battery using pennies , and a dozen other workshops. It will be a good time. Liên Đoàn Potomac was awarded 1st place for the campfire skit with the participation of Kenneth, David, Chan Toan, Nathan, Daniel, Thanh. Also, the Potomac color guards did an awesome job at the closing ceremony with Chan Toan, Minh Trung, Evan, Nathan, Ben, Athen, Thomas, Brandon, Damon, and Thanh.